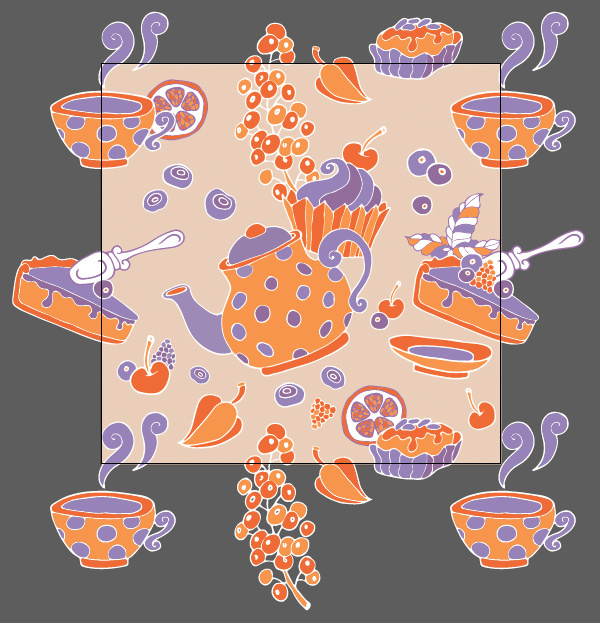 GFX9.COM share Create a tea party seamless pattern from a sketch in adobe illustrator, you can download now. 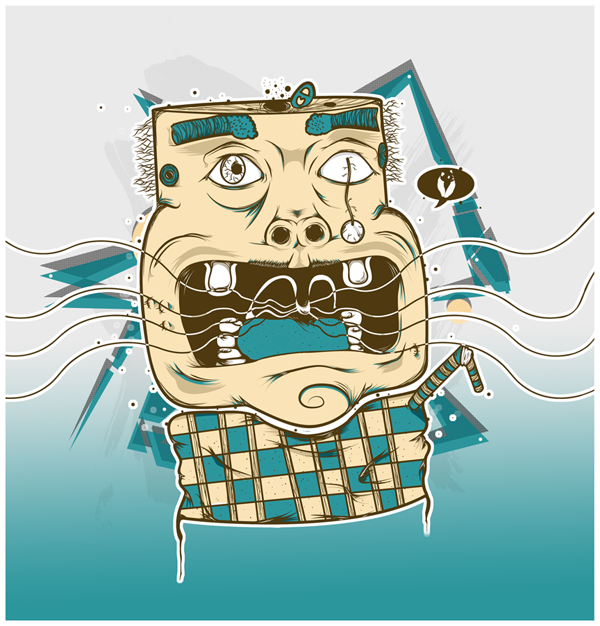 Tags: adobe illustrator, drawing, illustration, patterns, vector. 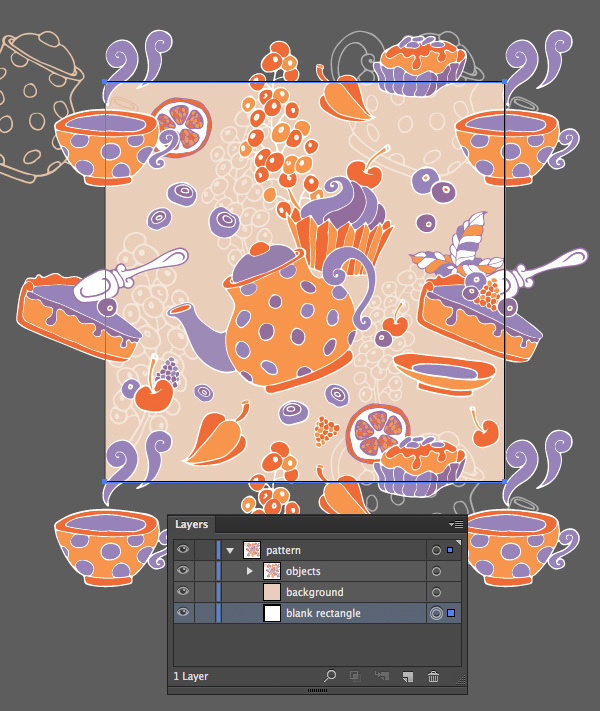 In this tutorial you will learn how to make a detailed seamless pattern without using a graphic tablet. 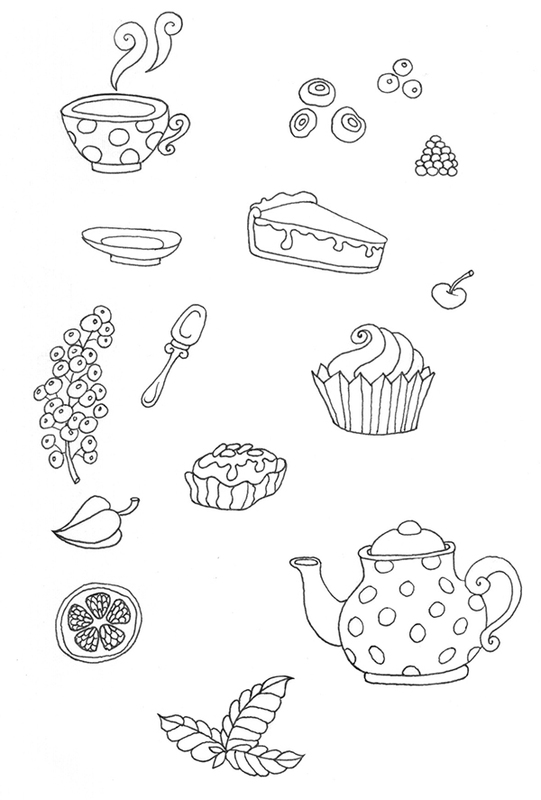 Arm yourself with your paper sketchbook and a pen or an ink liner to create a set of elements for your seamless pattern. 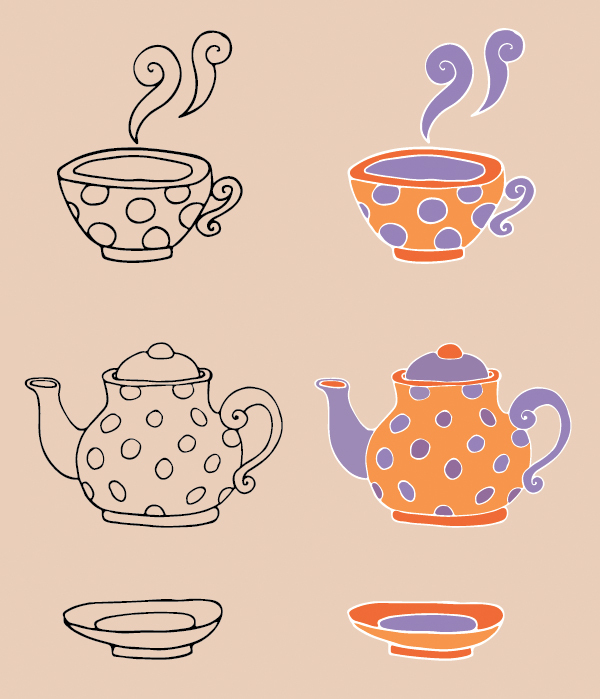 Then we’ll go through the process of turning our image into vector shapes, coloring them in Adobe Illustrator, and combining them into a colorful and whimsical pattern. Let’s get started! 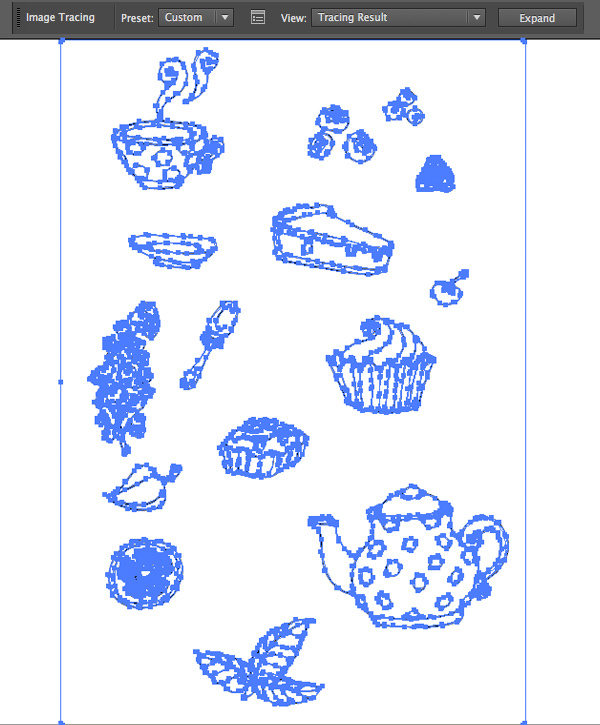 To start with, you need a doodle with a set of elements, which we’ll combine into a pattern. You can use my image below, or create your own with a pen or ink or whatever medium you prefer. If you've created your own, scan it carefully or take a photo, increasing the contrast and brightness in order to make the lines darker and the background clean and white. 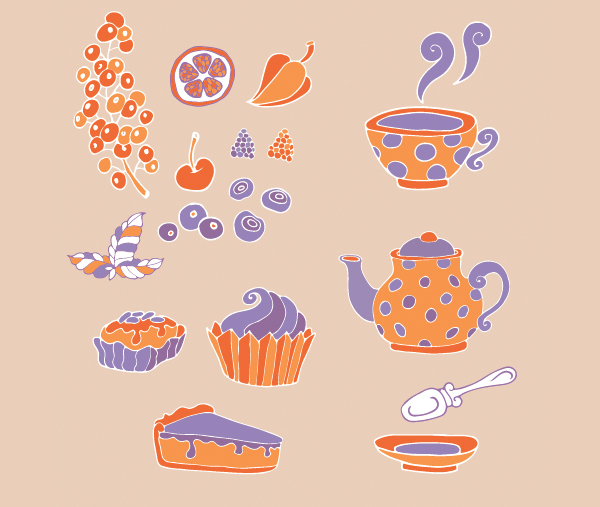 In this tutorial we’ll stick to a tea party topic and use such elements as teacups, teapots, muffins, berries, and all sorts of sweet things. 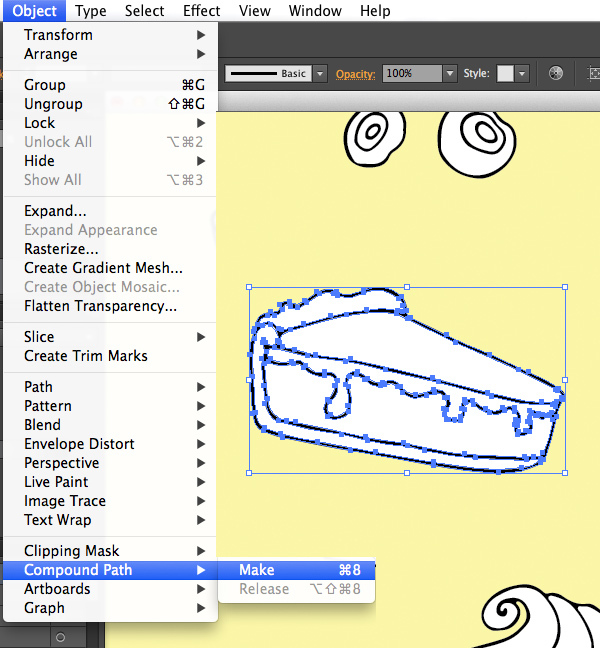 As soon as you prepare your sketch, head to Adobe Illustrator, create a New File with 600 x 600 px size, and File > Place your sketch onto the Artboard. You will see the Image control panel above, containing some information about the placed image along with the Image Trace button. 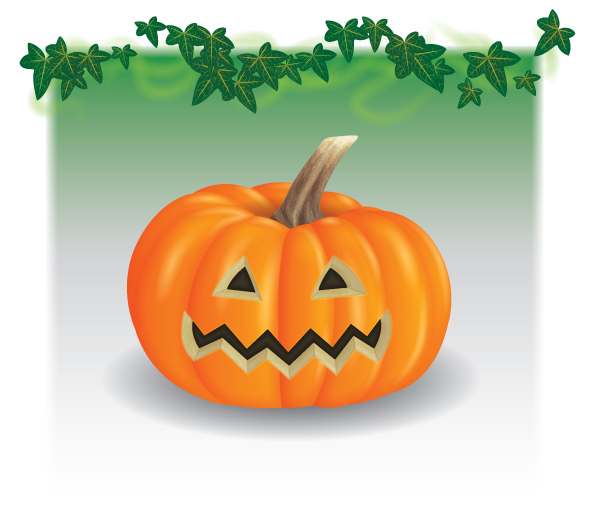 Go ahead and click it to vectorize your image. 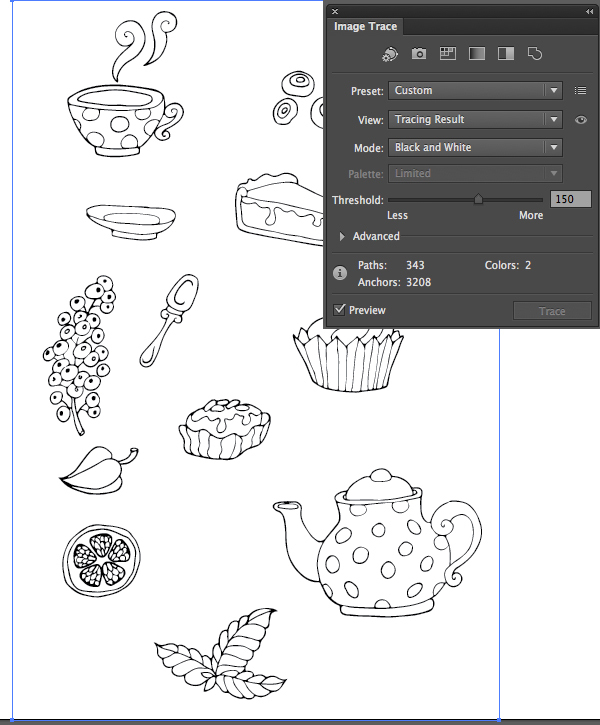 You can choose the Preset of tracing. 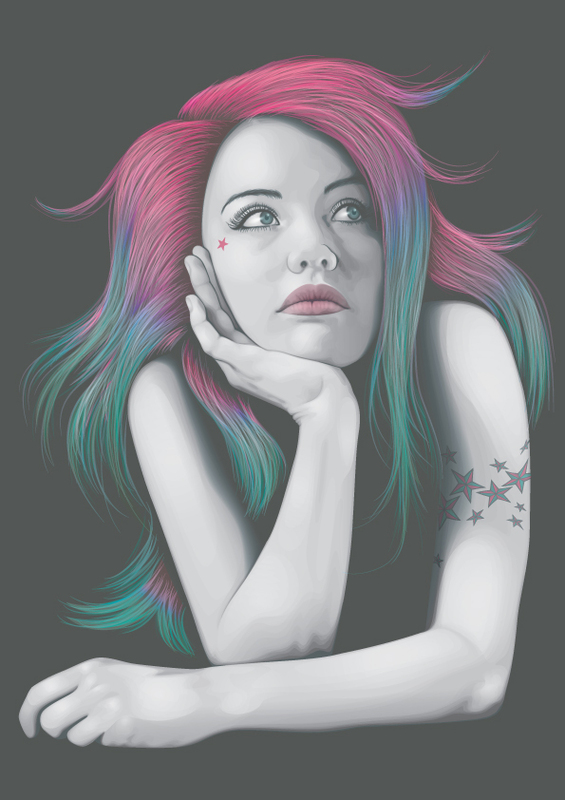 These presets help to achieve a better result depending on the type of picture: whether it is a complex illustration, a colorful photo, or a simple piece of line art. Let’s select the Shades of Gray style for our doodle. 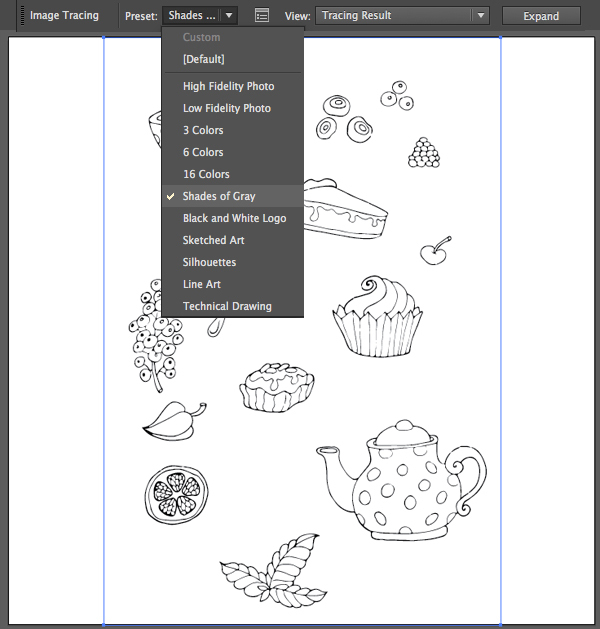 Click the Image Trace panel icon, which you can find in the same control panel next to the Presets, to reveal the Image Trace options window. Let’s change the Mode to Black and White and set the Threshold value to 150, leaving all other options as default. This way we are making the lines thicker and smoother. 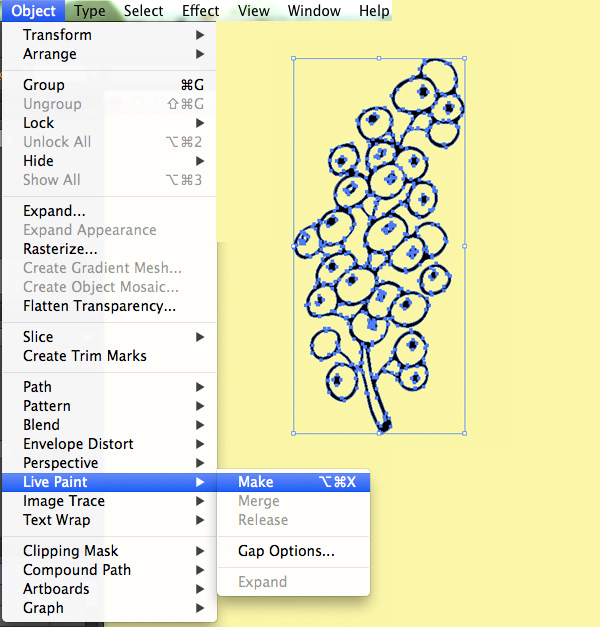 If you are happy with the result, go on and press the Expand button, turning the traced image into separate vector objects. 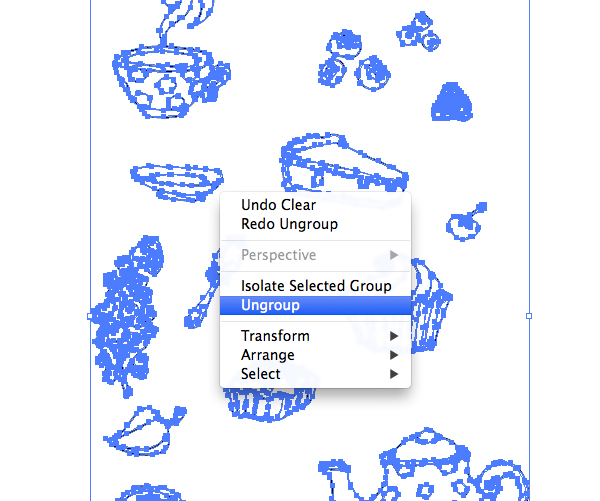 Right-click and Ungroup the objects. 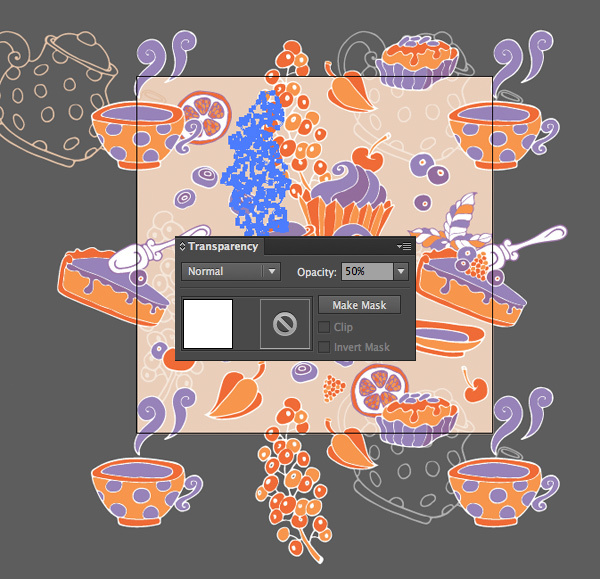 You can select the white piece of background by clicking with the Direct Selection Tool (A) on a blank space somewhere between the objects, and delete it. Let’s take the Rectangle Tool (M) and add a yellow square of 600 x 600 px size and Send it to Back (Control-Shift-[), placing it behind all other objects. This way we can detach the objects from a white Artboard to see them more clearly. As you'll notice, every object now consists of separate white shapes on a black background. We need to modify the items, but first let’s group each of them. Now you can just select the parts of the grouped object with the Direct Selection Tool (A) and change their Fill color to your liking. However, let’s try another technique. We need to turn the object into a compound path (Object > Compound Path > Make). This way we turn our group of elements into a single object with a black outline. Turn other objects into compound paths as well. You can do this more quickly by just selecting an object, right-clicking it, and applying Make Compound Path from the context menu. After you turn the object into a compound path, the white shapes disappear as well. Some unneeded shapes may appear after you've made compound paths, for example the black shapes shown in the screenshot below. 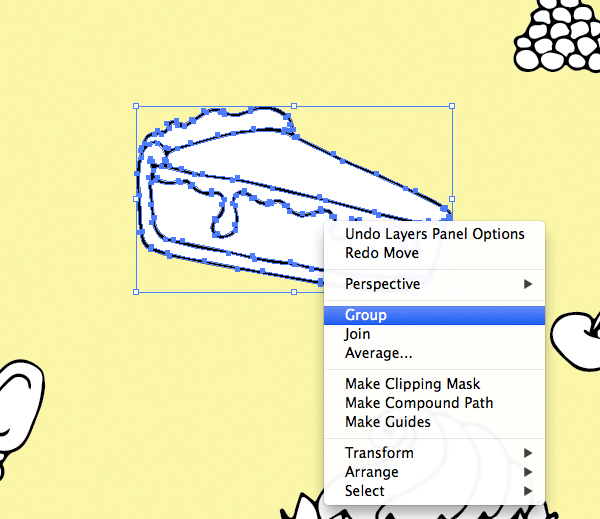 Let’s get rid of them by taking the Eraser Tool (Shift-E) and erasing the part connecting the unneeded shape with the outline. Once you've divided these pieces, select the black shape with the Direct Selection Tool (A) and delete it. Let’s enliven our objects by adding color! 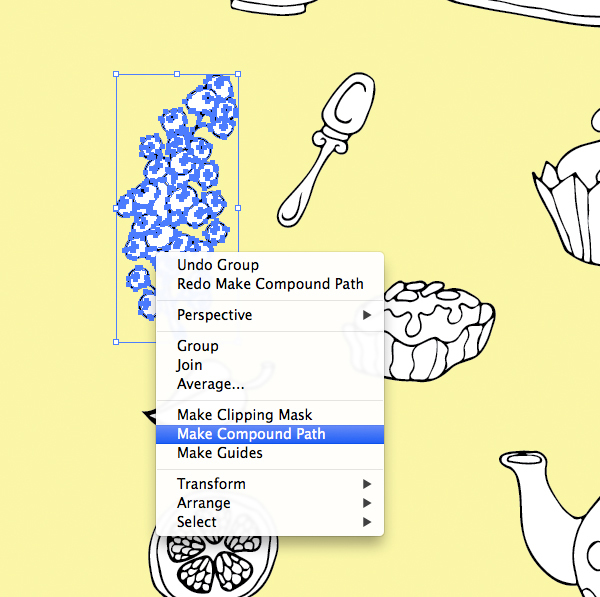 Select the shape and go to Object > Live Paint > Make. We’re going to use this yummy palette for our pattern. 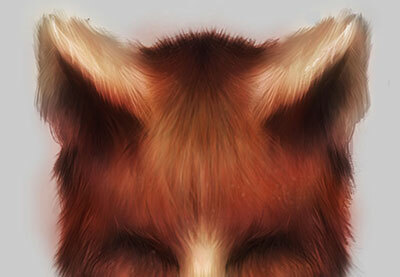 You can pick the colors directly from here with the Eyedropper Tool (I). 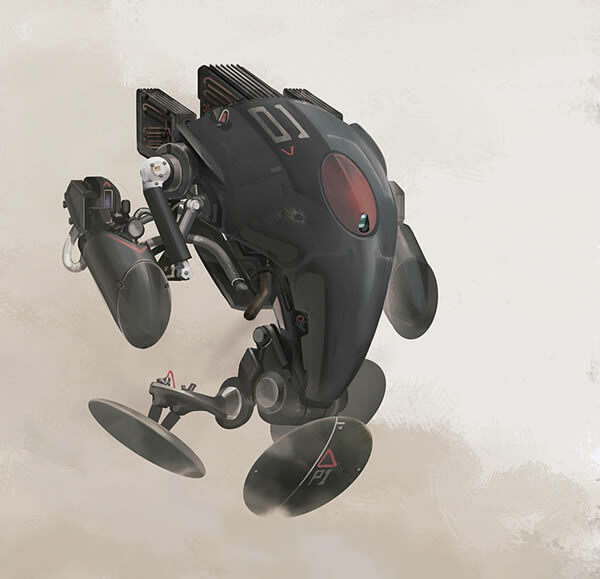 Select the object, pick the color, and use the Live Paint Bucket Tool (K) to apply colors. Move the mouse cursor over the shape you want to fill, and click when the red outline appears, thus applying a new color. You can recolor the outline of the object as well as filling its inner parts. 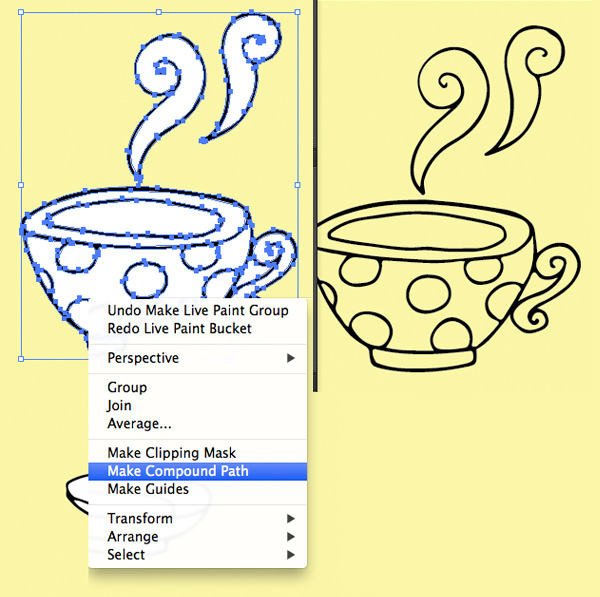 Use darker and lighter shades to make the objects more intricate and vary the color of the outline to add softness. Let's also change the background color of our future pattern from yellow to beige to make it more vintage. 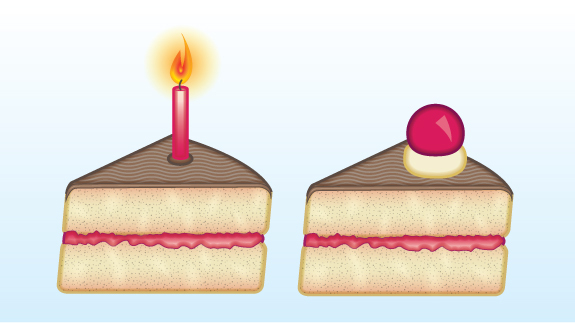 Move to the next object—the cupcake—and make it look tasty and attractive. 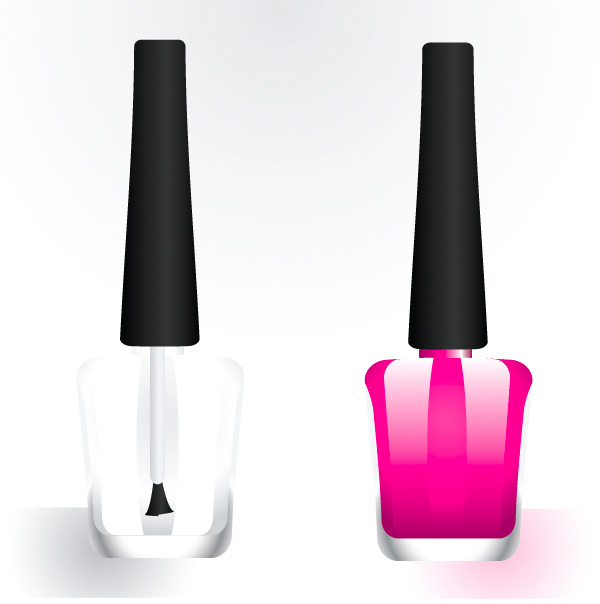 Use white for the outline to increase the brightness. Fill other objects with colors from our palette as well. 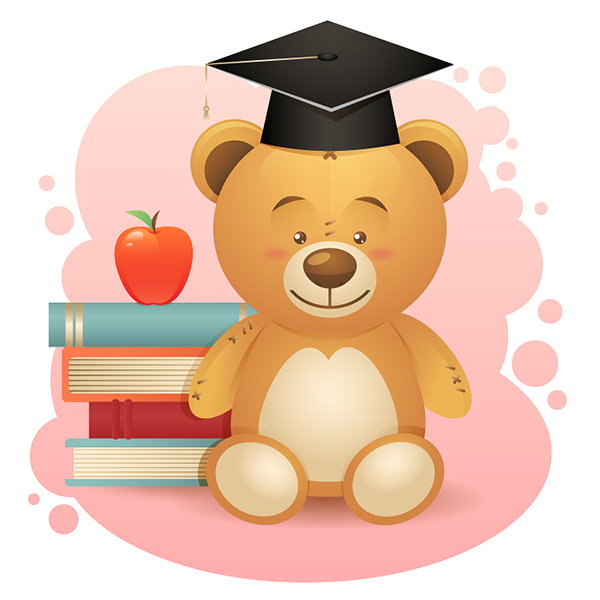 Here is what we have at this step—all our doodles are turned into scalable vector objects and colored. 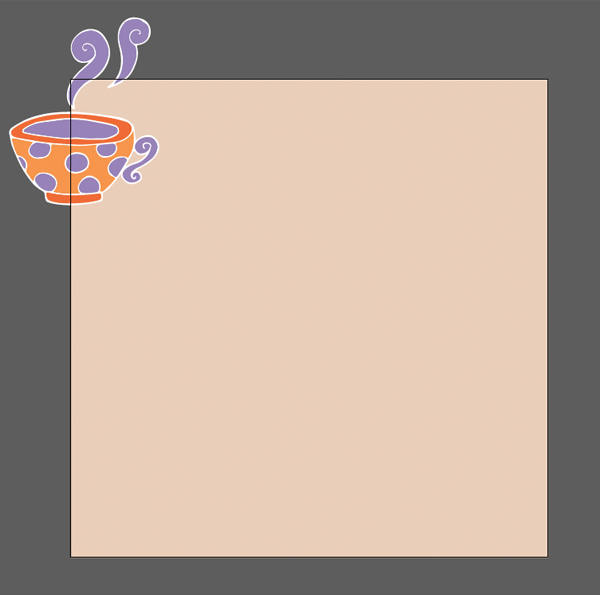 Let’s start forming the pattern by placing the teacup in the top left corner of our Artboard. 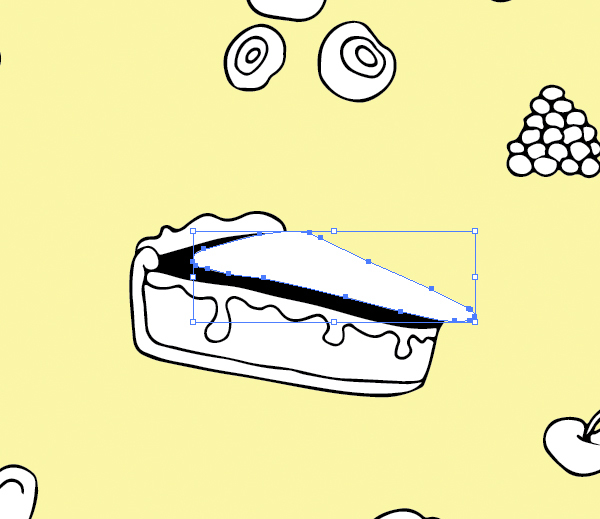 To make the pattern seamless, we need to duplicate the objects, which cross the sides of the Artboard and move them at the equal distance, according to the width and height of the background. Let’s see how it works in the example below. Select the cup and press the Enter key to call out the pop-up Move options window. 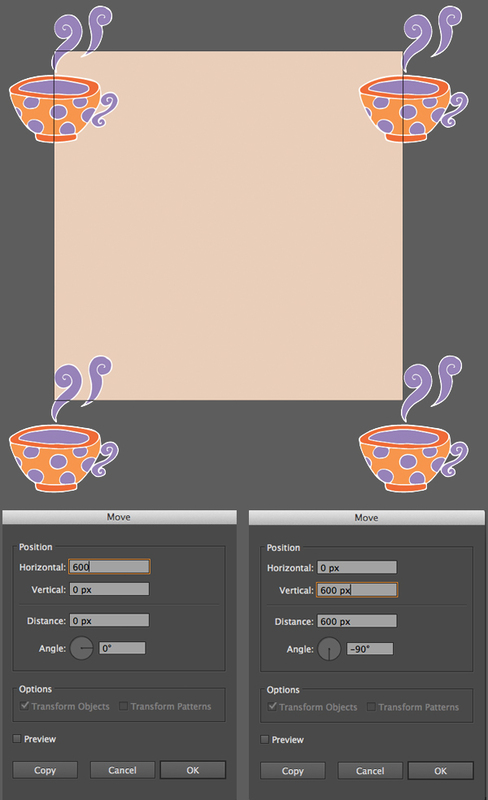 Set the Horizontal Position to 600 px (which equals the width of our background and Artboard) and click the Copy button to duplicate the cup and move it to the top right corner of the Artboard. Select the first cup again, press Enter, and this time set the Vertical Position to 600 px, moving the cup copy to the bottom left corner. Repeat these actions once again with the lower cup to create another copy in the bottom right. All in all there should be four cups, crossing all four sides of the Artboard. 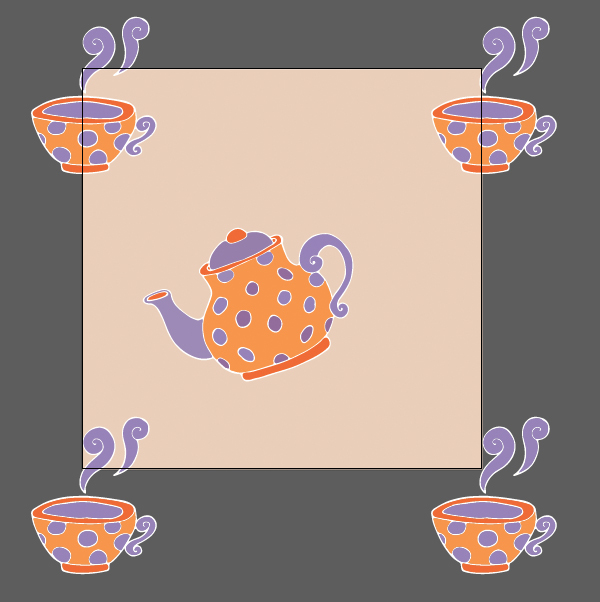 Put a teapot in the center of the canvas and rotate it slightly. You don’t need to duplicate and move it, as it doesn’t cross any boundaries. 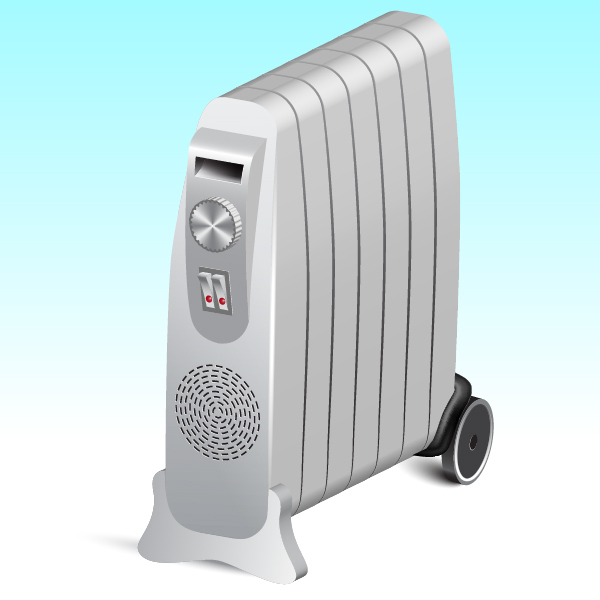 Add more objects, crossing the sides of the Artboard, and create the appropriate copies. 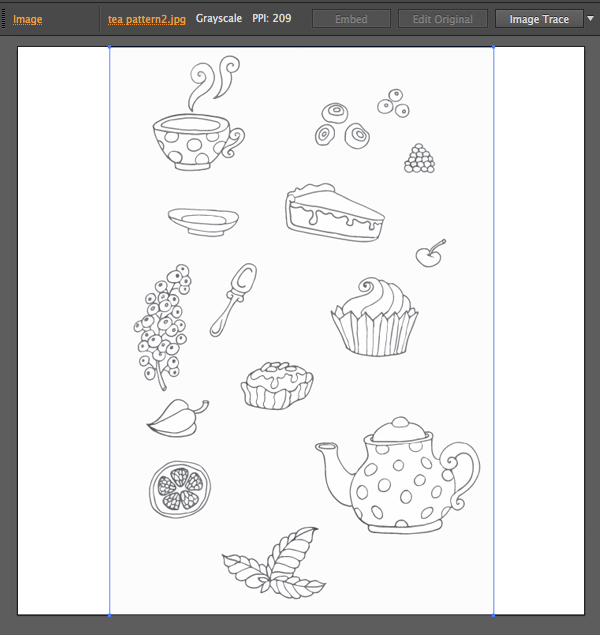 Add smaller details like leaves and berries, making copies and varying their size in order to fill the blank spaces among the main objects of the composition. 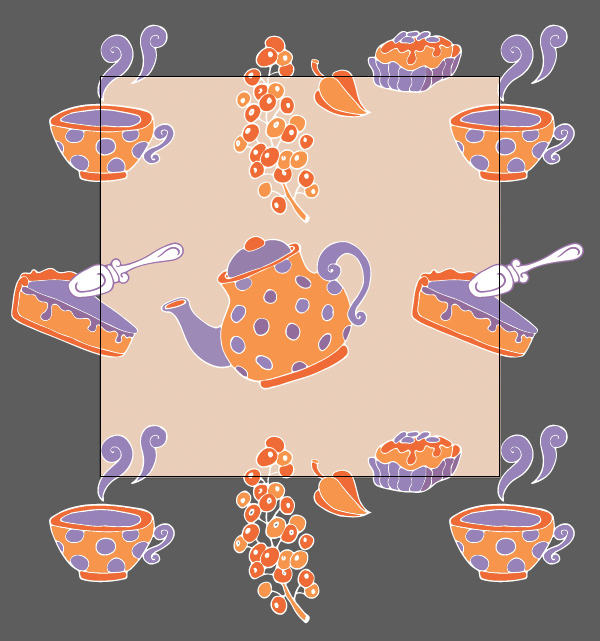 Take the outlines of our teapot and a branch of berries and put them between the background and other objects, filling the outline with white color and lowering the Opacity to 50%. This way we add more depth to the pattern, making it more spacious. Now that we are satisfied with the position of the objects, let’s find out how to turn our pattern into a swatch and apply it to various shapes. First of all, we need to set the boundaries of our pattern. 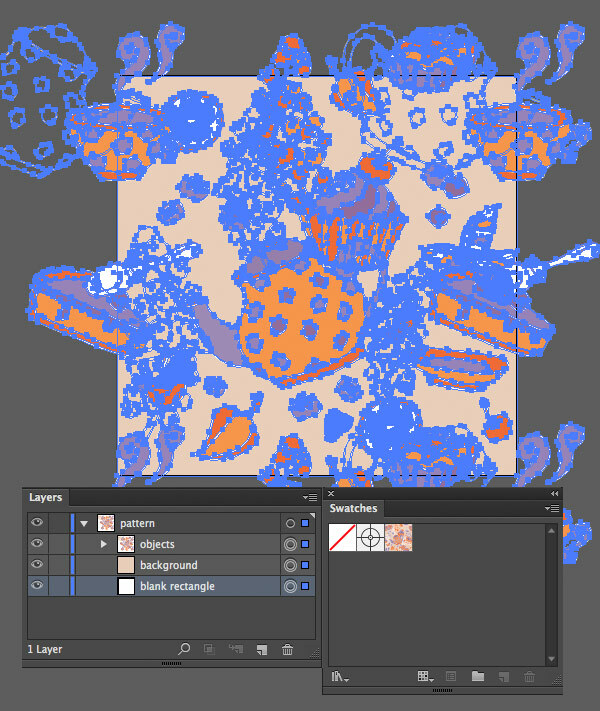 In order to do this, copy the square background and place it under all other objects by pressing Control-Shift-[. 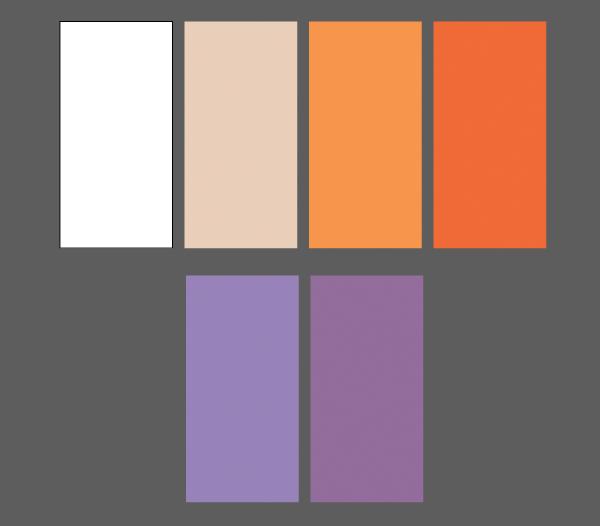 Set the Fill and Stroke color of this square to none, creating an invisible empty frame. Now the unneeded elements outside the frame will remain invisible when you turn it into a swatch. Select everything (Control-A) and drag the objects to the Swatches panel (Window > Swatches). Now we can create any shape—for example a rectangle with the Rectangle Tool (M)—and apply our pattern by clicking it in the Swatches panel. 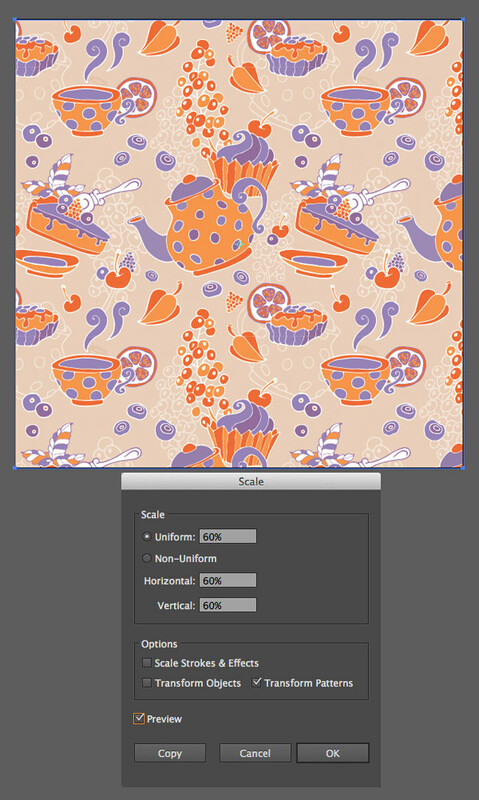 Use the Scale Tool (S) to change the scale of your pattern, and don’t forget to tick the Transform Pattern checkbox and uncheck the other Options boxes. Tada! 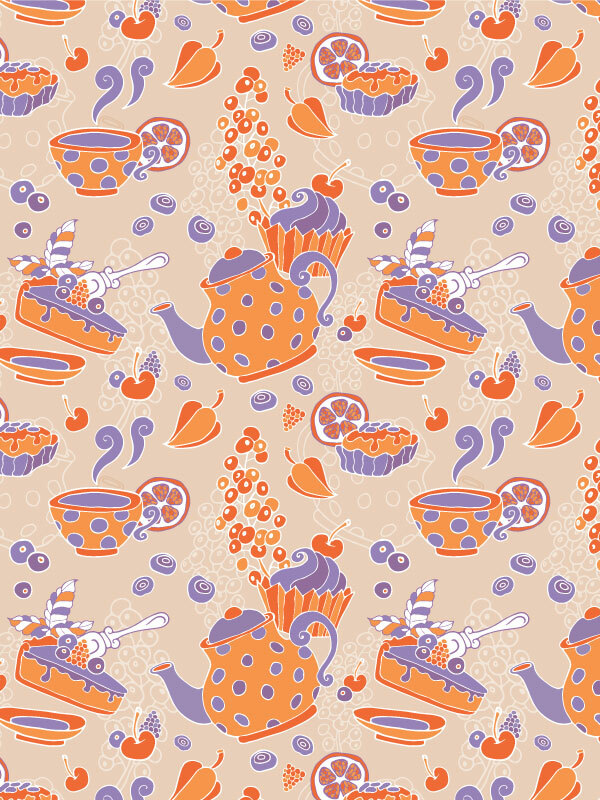 Our Tea Party Seamless Pattern Is Done! 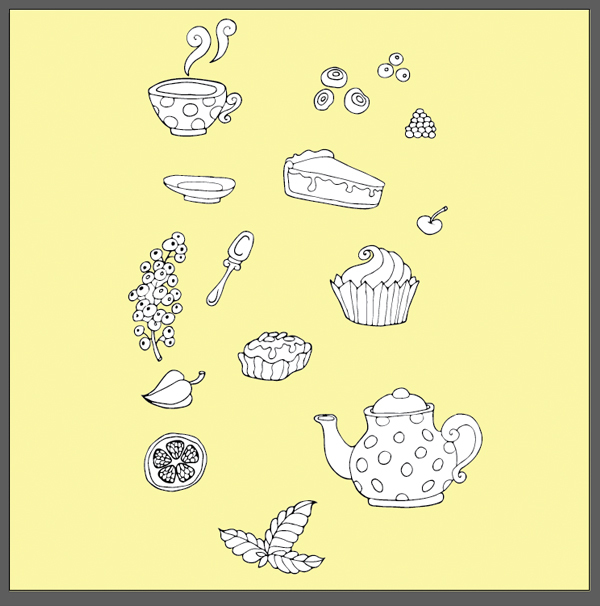 Congratulations, you did a great job, turning your hand-drawn doodles into an elegant, whimsical pattern! You can change the colors and rearrange the objects to your liking, giving the artwork a new look. 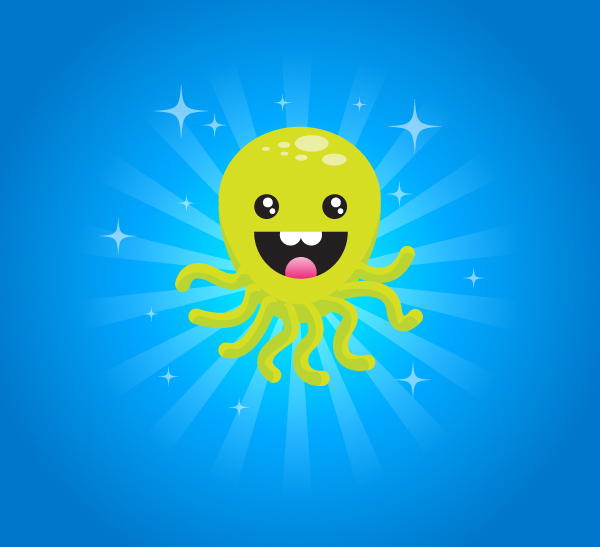 I hope you’ve discovered some useful new tips and tricks, and that you'll be back for more. Good luck!